today for irrigation, drinking water, and recreation. Major recreational activities include hunting, fishing, birding, biking, hiking, picnicking, and nature studies. Barr Lake is approximately nine miles around with depths near thirty-five feet. At 2.7 miles long and 1.7 miles wide, much of the southern periphery maintains wallows and flooded cottonwood trees. The lake is divided in half with the north-side dedicated as a recreational area and the south-side designated as a wildlife refuge. The lake is fed by the South Platte River. Barr Lake feeds several canals to support irrigation for agriculture in the surrounding area, the most notable are the Denver and Hudson Canals. 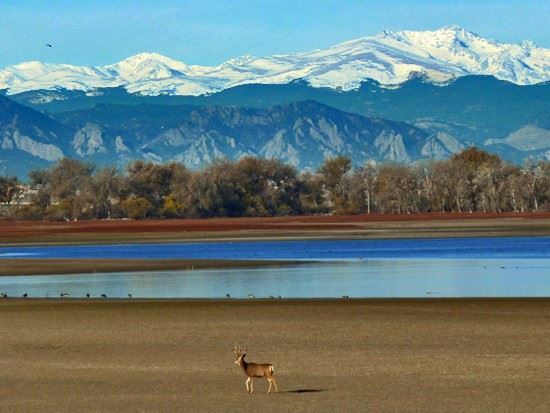 Milton reservoir is located north of Hudson and is also fed by the South Platte River. There is a ditch, Beebe Canal, that connects Barr Lake to Milton Reservoir. Before it was a lake, the area was an extensive wallow. The area was lush with vegetation and supported migrating species. Since the Ice-Age, millions of free-ranging bison migrated through these areas. It wasn’t until 1876 during the American westward expansion that their numbers were nearly eradicated. During this time, cowboys rounded up Spanish steer and drove them along the Goodnight-Loving Trail from Texas to Wyoming through the wallows. The railroads accelerated western expansion and transformed the western landscape into opportunities and dreams. The Barr Depot was established in 1881 bringing settlers, tourists, and entrepreneurs. In 1891, the Denver Reservoir and Irrigation Company inundated the wallows from the South Platte River to create Oasis Reservoir. The newly formed reservoir attracted the affluent from Denver. In 1896, the Oasis Hunting Club was formed and offered “city-dwellers the opportunity to rusticate in the great outdoors.” With great expectations developers tried to create Barr City. However, with the closure of the railroad depot in 1931, a second city for Denver never came to fruition. Barr Lake was officially created to meet the increasing water demands for a rapidly growing state, the Farmer’s Reservoir and Irrigation Company (FRICO) inundated the reservoir for the second time in 1908. It was boasted the reservoir could irrigate 25,000 acres annually. Due to seventy years of abuse and diversion of waste water from the South Platte River, the Denver Stockyards, and the sewage treatment plant, Barr Lake needed another transformation. 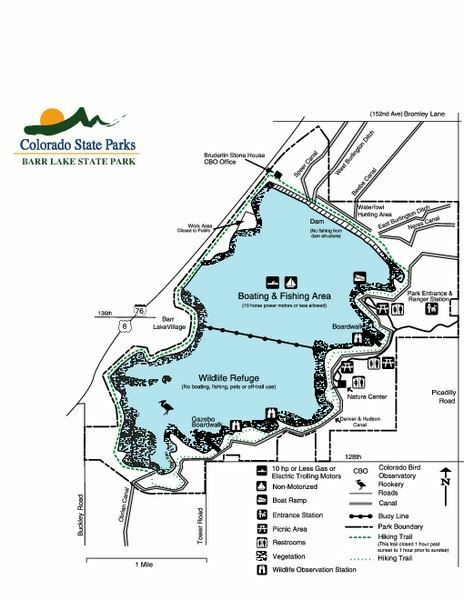 In 1964, the Colorado legislature proclaimed Barr Lake a “menace to health, safety and welfare.” The same year, Metro Wastewater was upgraded and relocated to its current location on York Street. To protect the natural resources, Barr Lake became a state park in 1977. Barr Lake is co-managed for irrigation/drinking water and recreation. The reservoir is overseen by FRICO and the Denver-Hudson Canal is overseen by the Henrylyn Irrigation District. Each company owns and operates the respective land and water within. 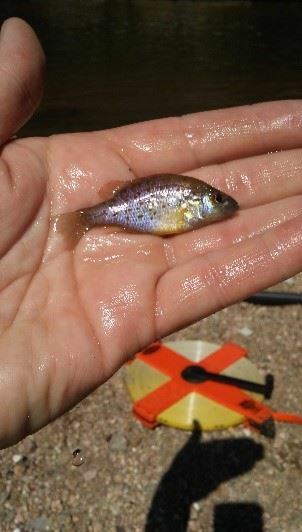 Water quality monitoring is conducted regularly by Barr Lake & Milton Reservoir Watershed Association. Sunset at Barr Lake by Bernie Ernie Jr.
Gerald Gaper earned a masters and doctoral degree in Analytical Chemistry from the University of Illinois at Chicago. With fourteen years of laboratory experience, Gerald’s early focus utilized analytical instrumentation to identify and characterize chemical compounds in water, bacteria, and on surfaces. Gerald worked on a variety of research projects for the pharmaceutical and academic sector, including Colorado State University. Over the last four years Gerald served the Denver Zoological Foundation as a Chemical Process Engineer and a Water Systems Manager overseeing the operations of pump stations and small water treatment facilities. Gerald managed the operations of a water quality laboratory while creating a development program for employees and an operational framework for the department. Gerald lives next to the open space in Westminster and enjoys spending time with his wife and three dogs. In his free time, he works on a 1972 F250 Highboy 4x4 truck and volunteers in the local community. He serves as a volunteer designing exhibits for the Evergreen Autobahn Society, garbage cleanup of waterways for the City of Westminster Open Space, dog walker for City of Aurora Animal Shelter, and photographer for the Kawasaki Kids Foundation. He is the Vice President of Education for Toastmaster International, Lafayette Chapter. Gerald serves as a member of the RMWQAA Education Subcommittee designing presentations and writing newsletters. As water professionals, our passion for water began somewhere. In our busy careers we may forget that we are all in the water industry for the same reason: our passion for water; and someone, somewhere—whether we remember it or not— instilled in us this passion. In the K-12 school system, riddled with pressures of standardized tests and now safety concerns, students in the Denver Metro Region get to take a break and just enjoy science for one day. 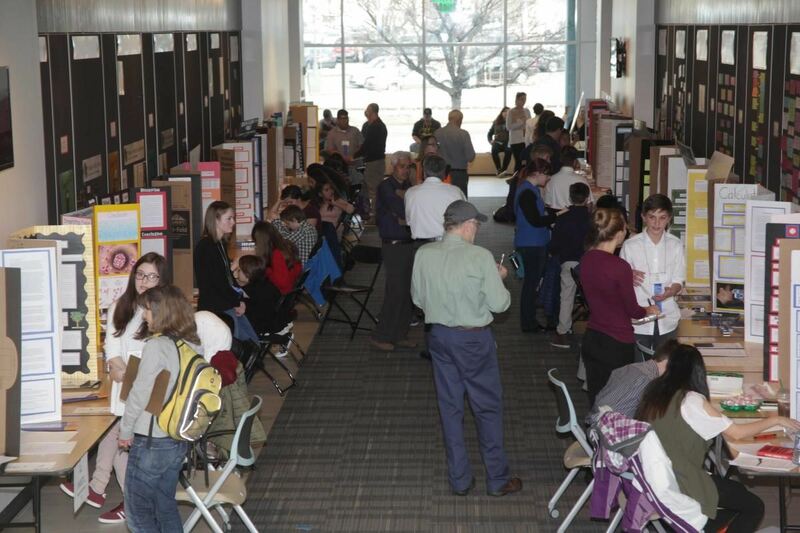 On February 16, 2018, upwards of 280 middle and high school students came together to showcase their science experiments at the annual Denver Metro Regional Science and Engineering Fair. More importantly, over 200 professionals volunteered at the Fair to encourage student’s passion for water. Water professionals served as judges to grant special awards to students ranging from scholarships, cash, and all-expense paid trips to national competitions. This year at the Fair, students received over 10 water-related special awards. 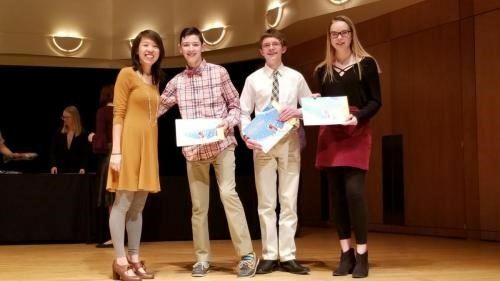 Top prizes and recognitions were awarded to students with innovative solutions to some of the nation’s toughest water issues. Examples of 2018 water-related award winners listed below demonstrates the complexity of projects showcased at the Fair. Stormwater Permittees for Local Awareness of Stream Health Award: Ester Mohamed, 8th Grade, Crescent View Academy: What do Humans do to Produce Algae? The future of water quality is apparent in these young scientists’ projects. It is important to foster young scientists’ passion for water because these students will be solving our upcoming water issues. 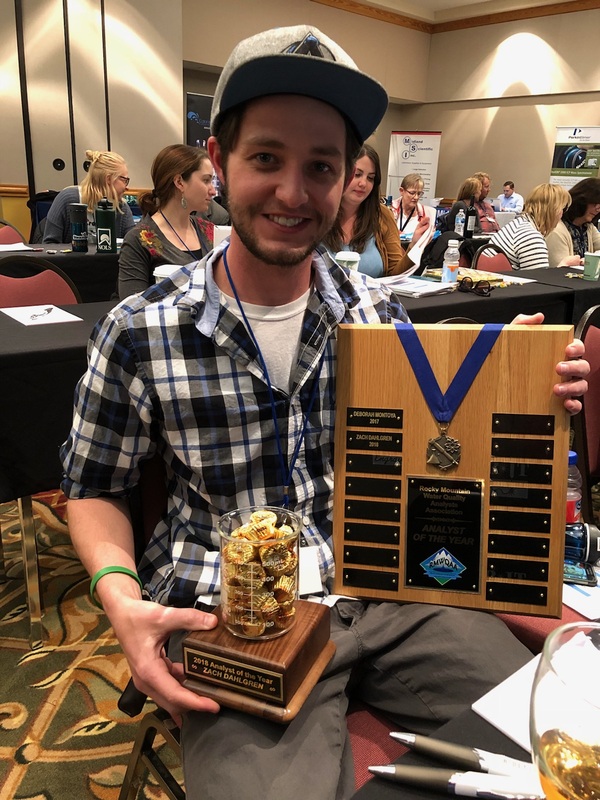 To volunteer for upcoming Rocky Mountain Water Environment Association/Rocky Mountain Section of the American Water Works Association outreach and education events or to sponsor an award at the 2019 Denver Metro Regional Science and Engineering Fair contact Jojo La at msjojola@gmail.com. Jojo La is an environmental engineer in the fields of water resources planning and development, water quality, environmental permitting, regulatory compliance, and public policy issues related to water resources and the management of natural resources. 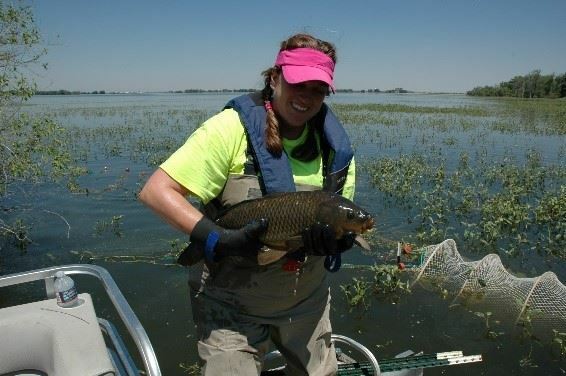 She assists public and private sector clients with Clean Water Act and Safe Drinking Water Act compliance including discharge permits, water quality monitoring, 401 certifications, and Section 404 permits. Algae is the enemy and these two warriors have the tools and the talent to help the city tackle it. 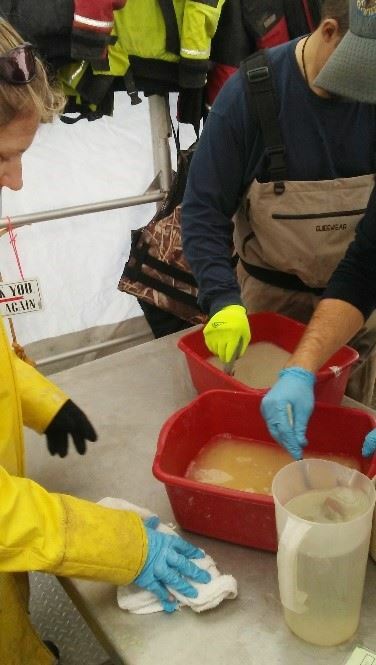 Laboratory Analysts Eric Scott and Trea Nance head out on Standley Lake about every two weeks to take measurements, check equipment, and investigate the water quality of Standley Lake and the creeks that flow into it. 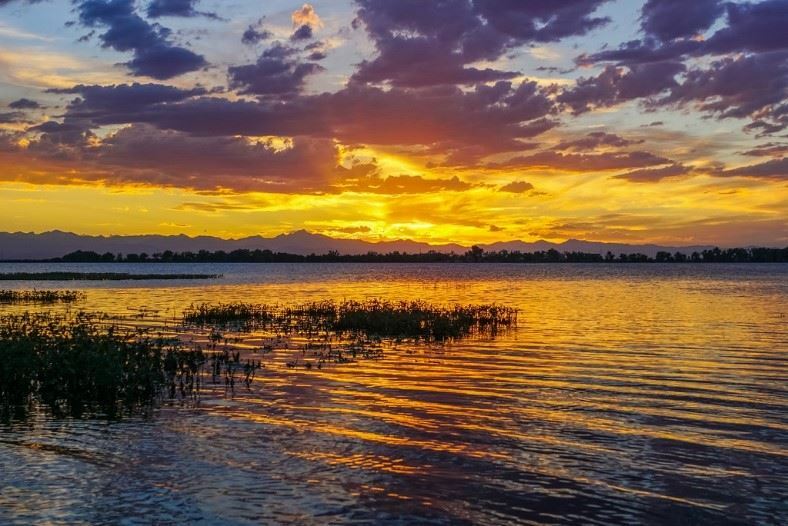 Standley Lake, the primary source of drinking water for the city, holds about 14 billion gallons of water, or a year’s supply of drinking water for the city. 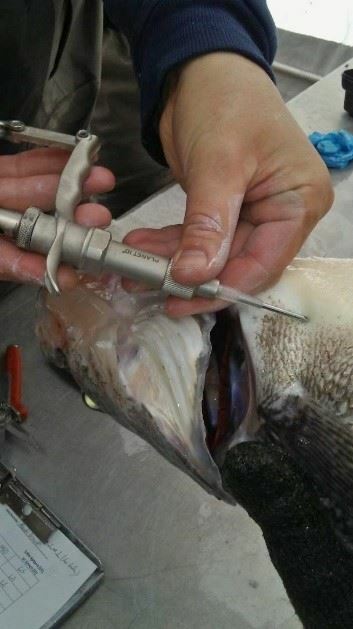 With water constantly flowing in and out of the lake, the water quality needs to be checked almost constantly. Water quality data is transmitted via the anchored testing station, but Scott and Nance also head out on a pontoon boat and check the water themselves. 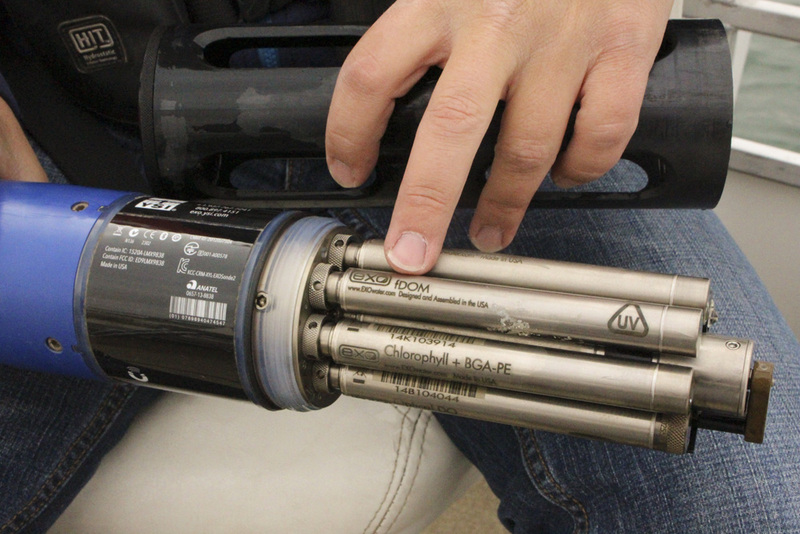 Their primary tool for evaluating the lake water is an EXO2 Sonde. It has sensors that measure the cloudiness of the water (turbidity), salt and inorganic material content (conductivity), gaseous oxygen (dissolved oxygen) and algae content (chlorophyll). One Sonde is stationed at the anchored testing station and Scott brings another to check water quality measurements at certain depth intervals in the lake. “Algae is important in lakes because it adds oxygen to the water, however, too much algae creates an ‘algae bloom’ which we need to manage via our water treatment systems before it gets into the drinking water,” said Scott. The other tool they bring along on their trips is a Van Dorn water sampler. The Van Dorn is a water bottle designed for sampling open water at a specific depth. The water is brought up and then portioned out into several sampling bottles for evaluation and dissemination to other cities who take drinking water from the lake, such as the city of Thornton. Another part of their jaunts into the lake is to check the Sonde and battery at the anchored station. They change out and recharge the battery every trip. They clean muck off the Sonde’s sensors…and clean off any bird poop or the remains of animals consumed by an eagle or owl left on the station. After getting back to the office, Scott and Nance work with water quality staff at Semper Water Treatment facility evaluating the data received from the Sonde and the Van Dorn. Scott then sends out email to staff and interested parties detailing the results. 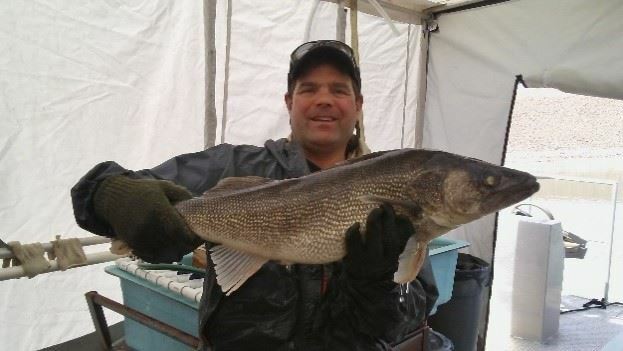 Another fun part of the email that Scott sends out are photos he has taken out on the lake. 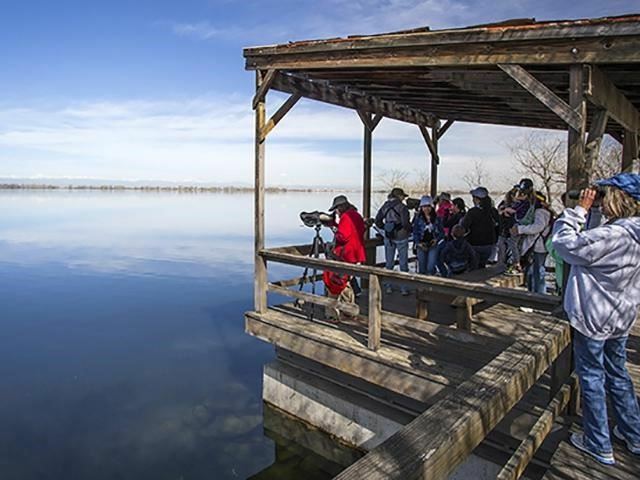 From panoramic scenic shots to up-close photos of geese and ducks, Scott has a photographer’s eye for capturing life out on Standley Lake. Westminster residents have some of the safest and best tasting water in the region and we have Scott, Nance and all the staff at Westminster’s Department of Public Works and Utilities. When the leaves start turning colors in beautiful Colorado, it’s the signal of what is called the “shoulder” season. Shoulder season is that time when Summer and Winter vacation destination locations try to attract visitors, and offer discounted rates to convention organizers. September and October are chalk full of industry conferences in Colorado and across the country. This year was no exception. I ended up crisscrossing the country for no less than 5 conferences in a period of 5 weeks. First up was the Rocky Mountain Water Environment Association/Rocky Mountain Section of American Water Works Association Joint Annual Conference (now there’s a mouth full!) in Loveland, CO. This year saw the largest attendance ever at a JAC. 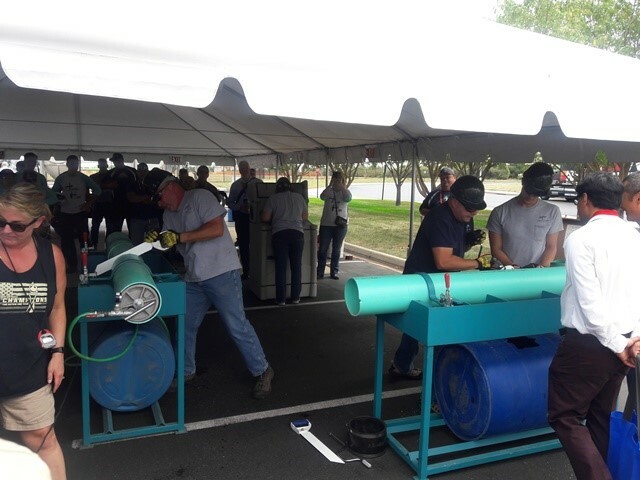 For those that have never had the opportunity to attend before, it is a chance to meet industry professionals from throughout Colorado, New Mexico, and Wyoming in both the water and wastewater professions. Operators, engineers, and of course laboratory professionals all gathered for 3 days and 165 technical sessions on that one thing that we all share a passion for; water, in all its glorious forms. This year’s conference began with an exceptional Keynote talk by Charlie Lundquist, Deputy Manager of NASA’s Orion Program. 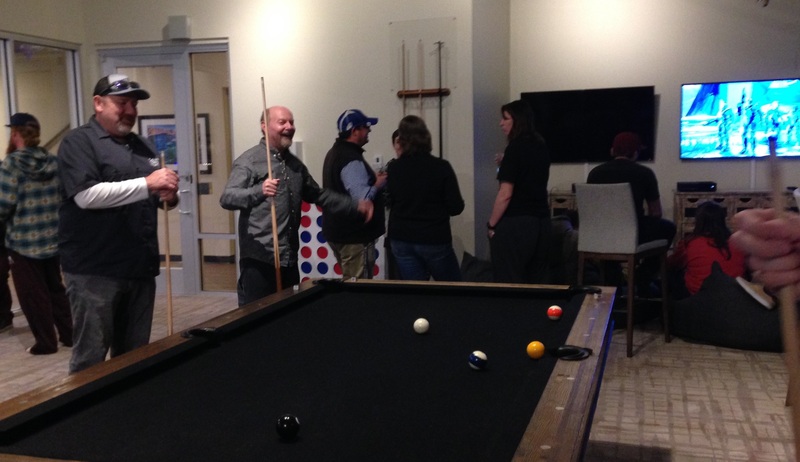 One of the highlights of every annual conference is the annual Toilet Trivia Bowl Contest, hosted by our very own Blair Corning (yes, once ours, always ours), otherwise known as SewerDude. Topics covered such things as WTF, Rhymes with Water, and Movies about Water. There was a fantastic track of Laboratory talks this year covering many aspects of the analytical lab. They attracted standing room only crowds for many of the discussions. Tuesday night was the awards dinner, where Ms. Natalie Love received the prestigious Water Environment Federation, Laboratory Professional Excellence Award. Congratulations Natalie! The award was well deserved, and thank you for all that you do for the Colorado lab community. Next was the Special Districts Association (SDA) Conference in Keystone. A wonderful conference in the mountains of colorful Colorado during early Fall. There is no more beautiful place to attend a 3 day gathering of Fire Protection, Parks & Rec, and Sanitation professionals. There were numerous technical sessions on issues that are unique to special districts, in law, community relations, politics, and management. All of the Keynote speakers were fantastic! The running theme for each of their talks was valuing employees. There was something to take home from each of the talks that can be applied in all of our jobs. The most poignant for me this year though was “You have to be present to Win”. You can’t just “mail it in” and hope for success. You have to show up every day, be present, and participate, whether an Analyst or Manager, to reap the benefits of team success. WEFTEC, a gathering of over 22,000 leading professionals in the wastewater industry from around the world. This year’s gathering occurred in Chicago in early October. A very large conference by any standard. So large it can only be held in cities that have very large convention centers. Generally, WEFTEC alternates between Chicago and New Orleans. 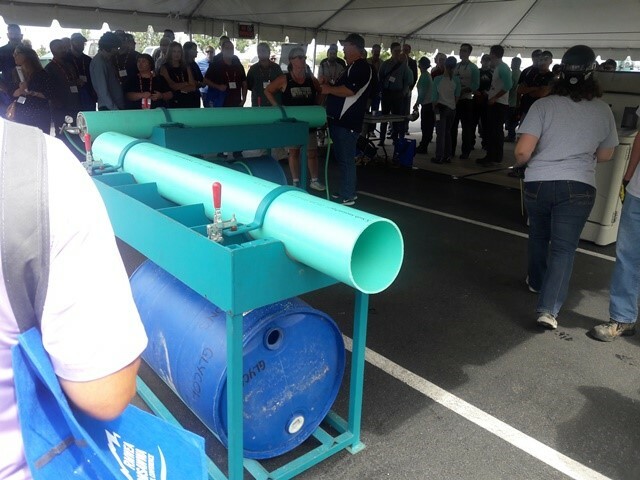 There were over 500 technical sessions covering every conceivable wastewater topic. The plethora of topics covering new and innovating technologies is mesmerizing. I found myself being drawn to over 12 different technical sessions on peracetic acid disinfection alone. Besides all of the tremendous talks, there were over 3.5 miles of vendor booths to see on the exhibition floor, which included many representing lab equipment, and in-line instrumentation. 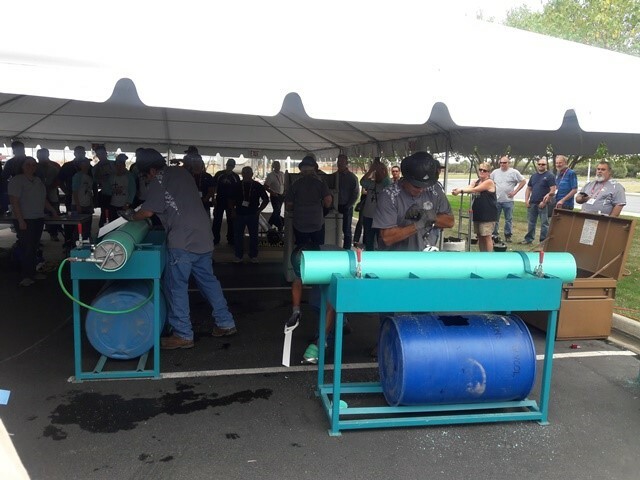 An annual highlight is the OPS Challenge, where over 60 teams compete nationally for prestigious awards in 5 different categories, one of which is a laboratory event. The teams practice all year long for this competition. 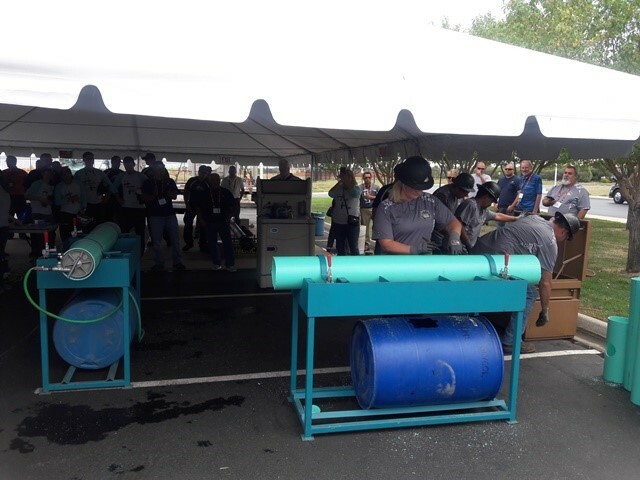 Colorado was well represented this with 2 teams from Metro Wastewater Reclamation District and 1 team from Littleton/Englewood Wastewater Treatment Plant. Both Metro and L/E have been National champions in the past. Some members of our organization have even competed on these teams. Off to LA. So the forth conference wasn’t for work. It was the 31st Annual National Hot Wheels Convention. Yes, there really is one, and yes it really was the 31st annual. There were over 1500 hobby enthusiasts in attendance. I am not going to bore everyone with the rest of the details, except to say, find your passion and play hard! Finding your balance outside of work allows one to grow in every aspect, the yin and yang of life. So to that end, I rented a sports car and drove down the coast to San Diego for the Association of Lab Managers (ALMA) conference. This is a conference that I have not attended often. When I had attended in the past, I found that most in attendance were from research and pharmaceutical labs. I was pleasantly surprised this year. Over half in attendance were from environmental labs. 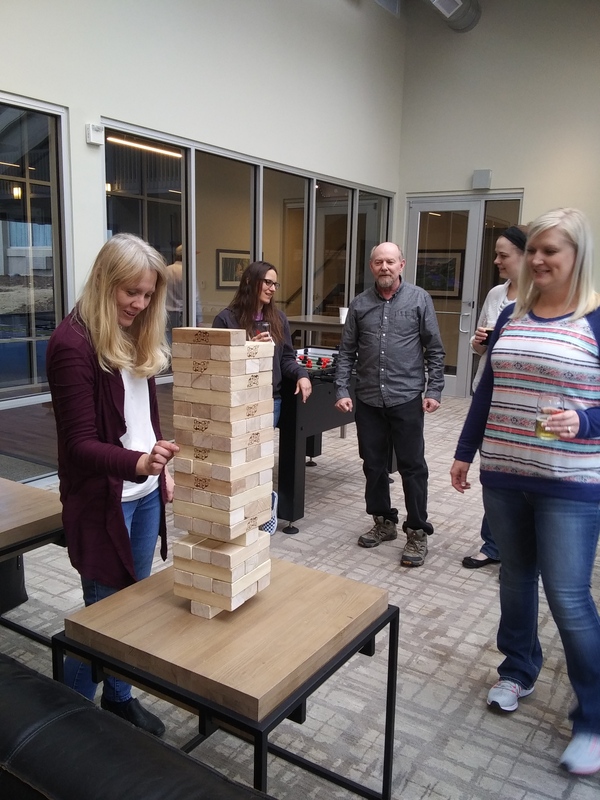 It was a great opportunity to connect with colleagues facing similar issues and discuss new and innovative ways for managing today’s laboratory. The focus being on managing our most valuable asset; people. There were many half day seminars that provided refreshing ideas on managing the multi-generations that occupy today’s lab. I highly recommend this conference to any lab supervisor that has a chance to attend in the future, but if you go, be sure to attend the workshops prior to the actual conference. Well that was my Fall. I’m tired, and ready for a long Winter’s nap! March and PittCon in Orlando will be here before you know it! What’s my role in the Colorado Water Plan? In May 2013, Governor Hickenlooper requested the Colorado Water Conservation Board (CWCB) work with stakeholders to create a plan for managing water collaboratively to meet the demand for growing water needs for agricultural, industrial, recreational, and municipal uses. In 2015, the CWCB released the Colorado Water Plan. Chapter 7 of the Colorado Water examines factors beyond water supply and demand; factors that affect water availability such as natural hazards, watershed health, and water quality. The Colorado Water Plan established a measurable goal to create Stream Management Plans for 80% of the rivers and streams in Colorado and to create Watershed Protection Plans for 80% of critical watershed by 2030. These plans will address a variety of concerns, including pre- and post-fire mitigation, forest mortality, water quality impairments, potential impacts of legacy mines, flood mitigation and recovery, aquatic and riparian habitat enhancement, and land use changes. The Colorado Water Quality Control Commission (WQCC), regulatory body that develops water quality policies and regulations for surface water and groundwater, will assist in this goal by setting a strategic water quality objective to have fully supported classified uses by 2050. These classified uses may including drinking water, agriculture, recreation, aquatic life, and wetlands. CWCB’s Colorado Watershed Restoration Grant Program will set aside grant funding to support the creation of Stream Management Plans and Watershed Protection Plans. Both of these plans will have a water quality component. 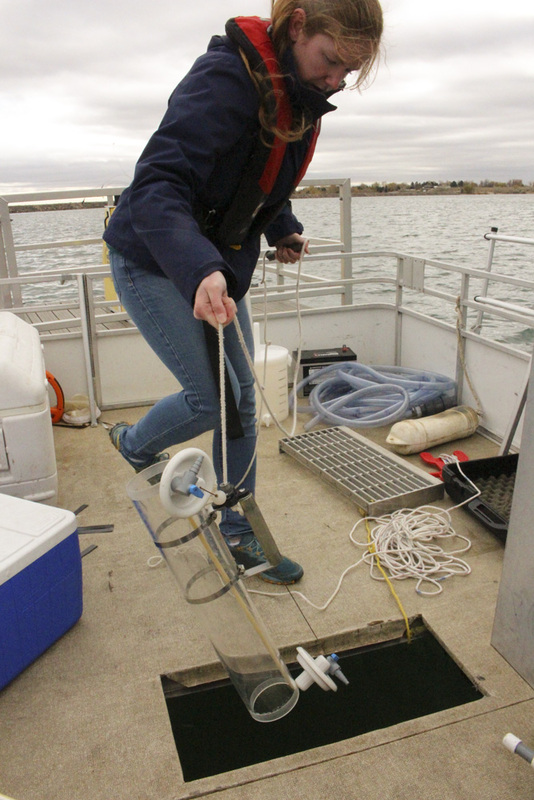 Some have developed a database of existing water quality data as well as reviewing the data to disseminate information, identify trends, and identify gaps or shortfalls in the data. 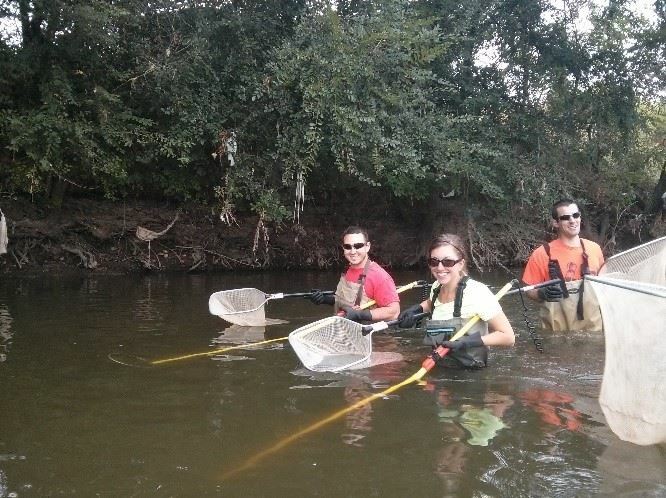 The plans also review the water quality data with the water quantity data to determine strategic locations for stream and wetland enhancement, stream/river restoration, and actions to take to reach water quality and aquatic life goals. As stakeholders gather to create these protection plans to reach Colorado’s goal by 2030, you may participate as a stakeholder, a data provider, a data analyst, or a writer/reviewer. If you work for a regulated entity, you may also be participating in stakeholder groups working to provide the science for future WQCC regulatory hearings where policy decisions will be made to fully support classified uses by 2050. 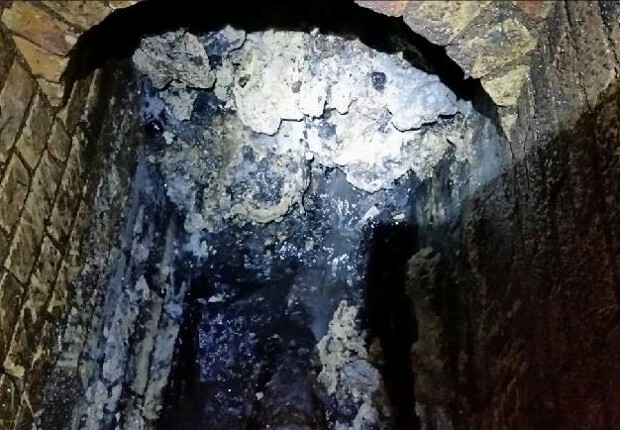 Last month London sewer workers discovered what has quite accurately been dubbed a “fatberg.” Beneath the streets of East London, tucked away in a sewage system too antiquated for the living style of current Londoners, sits a massive congealed fatty mess that is only now on the final steps of removal. Fatbergs aren’t a new phenomenon, they form in pipes and sewers when fats congeal and mesh together with used diapers, wet wipes, tampons and other various flushed items. However, this fatberg made headlines due to its massive 140 ton size spanning the length of 3 football fields, dwarfing the previous largest fatberg by roughly 10 times. The project was estimated to take 8 workers up to 3 weeks to fully remove from the sewers, by cutting out large concrete-like blocks piece by piece. This particular fatberg may have grown to this size for a number of compounding reasons. Dr. Tom Curran of University College Dublin’s School of Biosystems and Food Engineering sees the growing population of London and its high concentration of restaurants, pubs, and hotels as a “perfect storm for the phenomenon.” He also lends credit to London’s aging sewage system. The sewers of London were built using calcium-rich concrete which creates wastewater with a high calcium content. This causes saponification of the cooking grease in these systems and forms giant masses of cloth and fat. Though fatbergs are quite an issue in scenarios such as this massive 140 ton monster, there is the possibility of recycling fatbergs pulled from sewer systems into bio-diesel once the cloth and other contaminants are removed. This is taken a gross step further in some locations in China, where there may be an illicit trade in “gutter oil,” or recycled oil from fatbergs used in the cooking of cheap street food. It is nice to know that the bergs can be recycled into bio-diesel (gutter oil not so much) but fatbergs still remain a problem in many locations. The best way to prevent them comes down to public awareness, informing people that only toilet paper should be flushed down the toilets and any cooking grease and oils should be poured into a separate jar and disposed of in the garbage. This includes restaurants, where many in the U.S. have grease traps to help separate the oil and congealed fats so that they can be further recycled and prevent contamination of sewers. 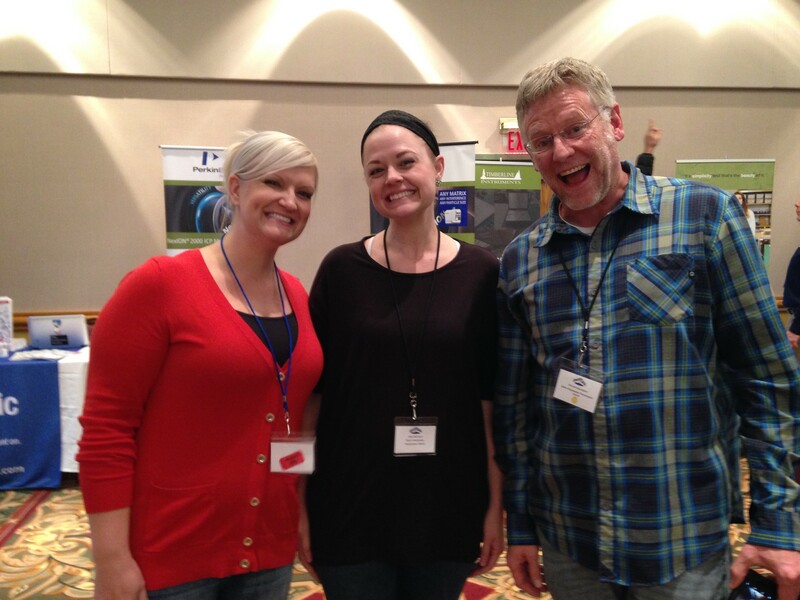 I attended the RMSAWWA Conference this year in Loveland, CO. 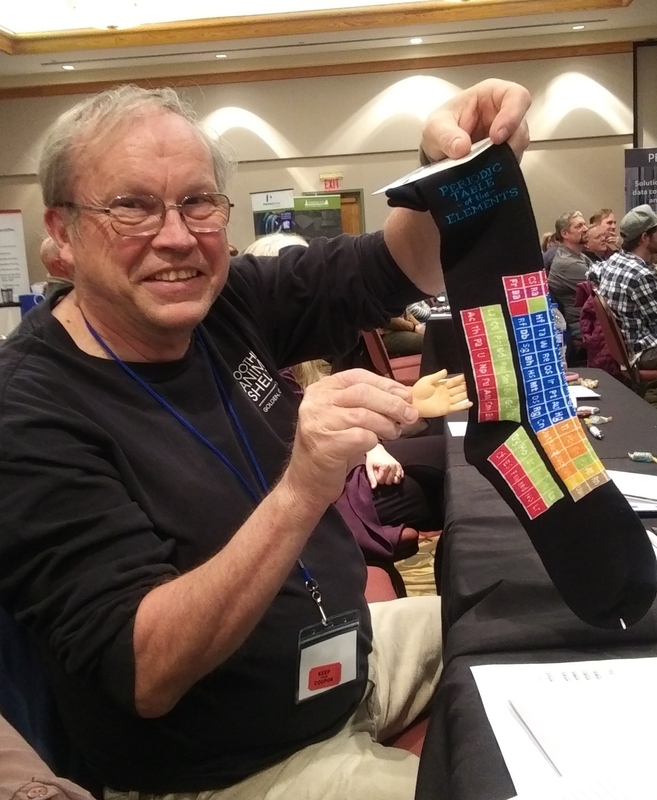 There were several different tracts for attendees to learn about the latest techniques, technologies, regulation changes, and equipment for the water industry. Before the afternoon sessions began I had the opportunity to watch the Operations Challenge. Coming from a drinking water laboratory we do not get the chance to participate in such fun activities. There were four teams participating: Commode Commandos, Sewerside Squad, Elevated Ops, and Heroic Hites. This particular challenge simulated a break in a line and the challenge was to see which team could successfully repair the break in the shortest time. Challenge set-up: the background pipe was the one with the “break”, the foreground pipe was used to cut a section for insertion into the broken pipe. There were a quite a few steps involved in the repair that I have simplified here mostly because of a lack of knowledge of the details. First, the area where the cuts were to be made was measured and marked. One crew of the team sawed through the pipe with a hand saw (no power tools were used) and the piece of pipe with the leak was removed. At the same time, another crew sawed the new pipe which was to replace the broken piece. Next, the new piece of pipe was inserted where the break had been removed. The repair was secured with couplers and ring clamps. The final step was clean up, putting away all of the tools back in the tool box. The time was stopped when the entire crew was back in place behind the starting line. As with any competition and teams that have practiced together for a while, they made it look very easy. The teams worked well together and encouraged each other even when they hit snags and speed bumps. The times for the teams to complete the challenge ranged from 2-3 minutes. After watching this challenge I have a new appreciation for our dedicated utility workers who keep everything flowing and flushing as it should.